Rarely does this blog venture into the slippery and dangerous roads of politics – as divisive as this area has become for American political culture. Yet the following intelligent post by Ray Dalio makes me feel duty-bound as an American to past this article on to all of my readers. Like Mr Dalio, I think we are rapidly approaching a critical juncture in our nation’s history, and one that is fraught with risk. Read the article for yourself. If nothing else it will arm you with better data with which to bolster your political pursuits. If you are as impressed as I am, please refer the link along to many friends. In this interview, Stan Druckenmiller, legendary investor and founder of the hedge fund Duquesne Capital provides a bone-chilling, yet thouroughly realistic synopsis of the state of the American economy in 2019. What America faces today (but also most of the developed world, including Britain, Spain , England, China and Japan) is a crisis of staggering proportions which politicians and the electorate have refused to address in any serious fashion. For good reason: the prospects are dire and the solutions politically noxious. Our levels of debt are so large that the government cannot continue its present policies and meet its promises to its citizenry. Our debt burden, totalling over 200 trillion dollars, is about 33 times the size of our federal budget, or 10 times our Gross Domestic Product. The size of this debt is so large we cannot honor it. To try to pay these obligations through taxation, Druckenmiller explains, would require increasing every form of federal taxes by 55% on every man, woman and child – but that would cause such a decrease in productivity and growth that it would collapse the economy. Alternatively, we could decrease all government expenditures for other items by 36%, permanently. it would require us to grow our economy by more than our rates of interest on the debt, measured at the interest on long term government bonds. Currently, that is around 2.7%. Unfortunately, in the last 10 years, the US real GDP growth rate has lagged below that rate, so our indebtedness is growing instead of shrinking. 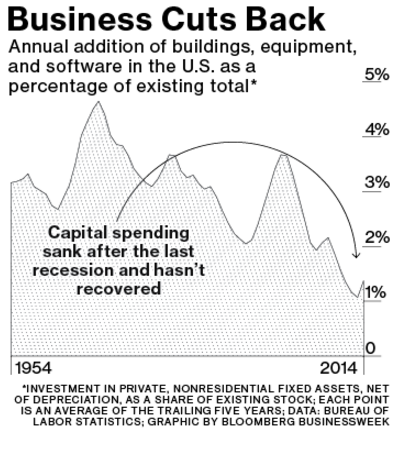 The US did achieve real growth rates as high 6% in the late 90′s. See the Mercatus analysis of those years here. If we can achieve that again, there’s a way out of this mess. To achieve that, we should learn from history, taking a look at the 90′s and seeing what we did right back then. Unfortunately, that was a period we had the winds at our backs, with very favorable demographics. Our situation today is the polar opposite. Since we cannot boost our productivity by throwing more young bodies at the economy, we will need to look at technological breakthroughs to increase our productivity while medical improvements extend the lives and abilities of an aging workforce. Protecting your portfolio against a sharp market drop is essential for today’s investor. 3 percent of your assets can hedge 100% of your portfolio. Use options to ensure your portfolio will thrive in the next crash. At the risk of being labeled a perma-bear, I will again repeat that it’s time for investors to revisit their hedging strategies. I won’t go into the reasons here. Instead, I’ll show you how you can cope with the risk of a 20% to 70% drop in the stock market without being crushed. This strategy can’t save you from all losses, but it can keep those losses small, without notably affecting your upside in case this prognosis is wrong. Let’s assume you’ve got around $100k invested in a mix of growth and income companies paying you a great dividend – earnings you expect to be around 3% a year, with good prospects of moderate long-term growth and little chance of bankruptcy. If you are in your 60s, 70s, or 80s, you might not be so sanguine about waiting out a 60-70 percent drop in the market. So here’s how you can use options on a major index in order to sleep well at night. First step: sell about $4,000 of your least performing investments in order to raise cash for this hedge. The hedge will cost you around $3,700 or 3.7% of your portfolio and will give you profits in a large drop in the markets as well as a continued market rise. It will limit your losses to a tolerable 6-8% in a moderate 10% to 20% drop in the markets. So how would this options play be affected by different market outcomes? Take the following 3 graphs with a pinch of salt. 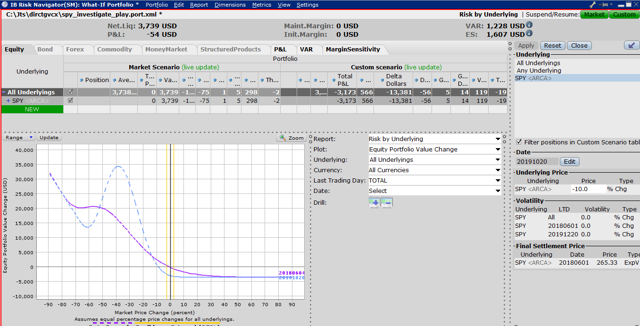 The first shows possible value ranges at 6 months, the second at 12 months, and the third most important graph at expiration of the options contracts on December 20, 2019, roughly 22 months out from today. Why the pinch of salt? Because we’ve not varied the volatility from its present value. This would introduce too many variables and just confuse the reader. True, on stark market drops, the volatility is likely to increase. Since this particular option setup is vega positive, it benefits from a rise in volatility. So actual profits would likely be higher than shown in the graphs and in the subsequent summary table. On a rising market, volatility is likely to decrease and the losses would be the same as shown in the tables below. Our intention is to hold the options hedge to term, so the intermittent graphs are only important to give the investor an idea of how the options portfolio’s value is likely to fluctuate over time. If you know what could happen, you’re unlikely to bail out of the hedge too early. As you see, this hedge provides great protection against a big drop in the market, allowing you to reap around 10% profits even in the case of a market meltdown. Yet, it still does well in a market rise. Unfortunately, the trade-off is in the case of a small market swoon in the 0% to -20%. Here you lose around 3% overall, including your dividend income. For most investors though, that is something they can live with. Disclosure: All investments involve risk. In particular, options hedges are complicated products and should only be undertaken by knowledgeable investors. This is not a solicitation to buy or sell. They say a picture speak a thousand words. In that case this video speaks volumes. Take a 15 minute dive into the next paradigm shift: the end of oil’s dominance in global economics. Enjoy the video, courtesy of Bloomberg. Oh, and if you happen to be an oil sheik – this would be a good time to start trembling. How do you benefit from the likely growth of AI (Artificial Intelligence), Gaming, assisted reality applications, and driverless car technologies? Buy the companies that produce the technologies at the heart of these applications. This post makes the case for Micron. 1) NAND will be the backbone storage system for the avalanche of new data produced by the Internet of Things. 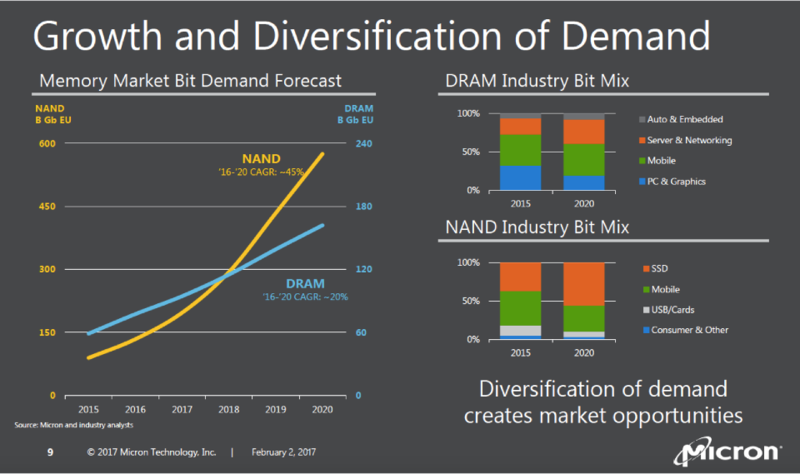 Other technologies will play important roles, but NAND will be dominant over at least a decade. 2) NAND supply will seriously lag demand, forcing prices higher, and richly rewarding leading NAND producers. 3) Micron is will poised to dominate this sector, along with Samsung and 5K Hynix. I want to give credit to one of my Seeking Alpha colleagues “Truth Investor” for his great analysis of this stock : DRAM strength and Micron Be sure to read more on this company there. Artificial Intelligence, High Growth Sectors, Internet of Things Enter your password to view comments. For the last 200 years, it has always been safe to invest in a balanced portfolio of stocks and bonds, weighting more heavily towards equities at a young age, and more heavily towards bonds as the years pass. Over time, you could count on your wealth increasing and outpacing the cost of living, and leaving you in good shape to face your last decade or so of retirement. That was then. This is now. We are facing a time when that traditional approach will fail miserably. When equities go through their inevitable correction – its a question of when they do that, not whether they will do it – investors will find no safety in bonds. Long term treasuries will drop by 30% to 60% , short-term bonds will drop a lot less, but still enough to cancel out two or three years of dividends. Readers of this blog will not be shocked by this admittedly depressing and alarming assertion. A previous posting dealt with a number of warning signs I see forming on the horizon and explored this topic. In that vein, let me point you to the musings and concerns of the very well-respected economist and newsletter writer John Mauldin, who brilliantly diagnoses the dismal economic corner the world has painted itself into, which can only end in tears. A followup posting to this will suggest some concrete defensive steps you can take to protect and grow your portfolio in these challenging times. Traditionally, one of the safest investments strategies for folks close to or in retirement was a 60% / 40% stock bond ratio, invested in the well-run, low cost or no-load mutual funds. This article explains why “This Time It Really Is Different”, and investors pursuing that approach today may suffer profound regret. As this shows, over the last decade investors in Vanguard’s VWELX or VWINX fund would have gained more than investing in the S&P 500 (up 96% over the period), 150% and 131% respectively. Equally important, they would have done so with far less drawdowns in the crash of 2008 (24% and 48% vs S&P’S 78% drop). In fact, as I’ve shown in a previous article in , Seeking AlpSeeking Alpha’s financial blogh, this outperformance of the 40/60 balanced approach holds well going back over another decade. But today, I am convinced, the logic behind those patterns no longer holds. As a consequence, both stocks and bonds will drop in sequence, rather than acting as counterbalances. This means that your 60% stock holdings could bring you a huge amount of pain, while your bonds only bring you a large amount of pain. Either way, the next effect is very painful. I liken the moment we find ourselves that of the real estate market in mid 2006. The signs of a crash were imminent, and many smart people were warning of ludicrous values, dangerous mortgages, shady mortgage practices, and a warped property to income ratios. I remember at that time warning a friend of mine not to engage in his fourth house flipping in 10 years. Unfortunately for him, he ignored my advice, only to be later faced with a $1 million mortgage on a $500,000 equity value and monthly payments double his income. Back in 2006, I could not tell him for sure when a crash would happen, and what event would trigger it. I just recognized that values were not sustainable. In fact my timing was a bit off. Another year passed before housing prices lost 70% of their value. As you can see in the graph of Real Estate Investment Trust prices below, real estate values climbed another 20% over the next year. Was I wrong to warn him off his investment? Obviously not. Many small fortunes were built on the precept of “selling a bit too soon”, and far more were lost on the premise of “following the wisdom of the crowd”. 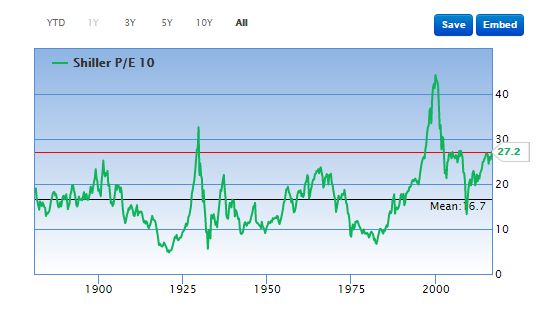 Shiller’s Historical Price Ratio . P/E ratios, fueled by the FED’s money printing, are at levels usually found just before market crashes. 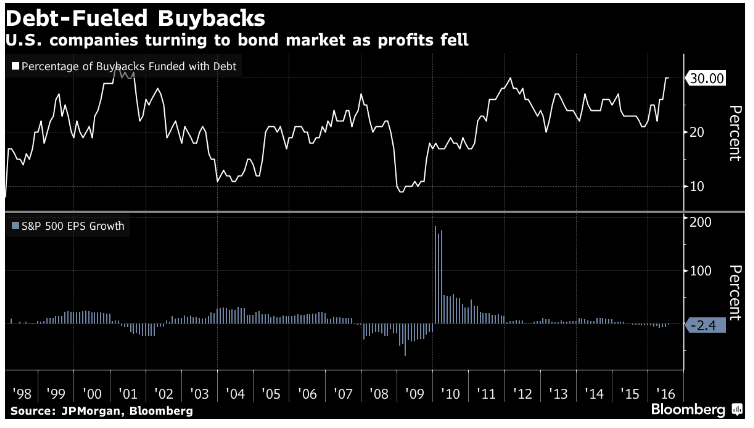 Corporations are propping up stocks by using “quasi-free” money by borrowing in corporate markets. In the past, when borrowing levels got so high, market crashes often followed. Will this time be different? One of the biggest areas of concern, is that corporations are not making the capital investments that result in real long term growth. Even the economists at the FED – not exactly innocent of a role in the decline of capital goods spending – recognize the danger in this steep decline. They attribute 80 percent of a country’s future growth to the investment in capital goods, as a recent FED study demonstrates. Corporate profits have declined over the last four quarters, yet the stock market is making higher highs. Bubble anyone? Productivity has ground to a halt. The money supply (M2) has been increasing by 6-7% a year, which has always ended in the past in inflation. OK, so maybe you believe that a stock market correction is possible, and even probable. But why does that imply that both stocks and bonds will decline, and that the traditional haven of bonds will not hold? The answer is: because overall bonds are overvalued. Today, if you invest in any company that can be reasonably assured of avoiding bankruptcy even in a severe market downturn, you are paid around a miserly 2% over 10 years. If long term interest rates regain even half the value by which they have dropped in the last 6 years, an investor buying those bonds would see values decline by far more than their coupon payments. If instead of selling at a loss, they hold them to term to obtain a return of capital, on a net basis they are likely to be a loser to inflation. If, on the other hand, you go for higher interest rates to protect from possible future inflation and interest rate hikes, you are now faced with greatly increased risks of default and total loss of principal. There is one scenario that is good for bonds, and in this author’s opinion is more likely to happen. That is a severe and prolonged recession affecting most of the global economy. In that case the central banks of the world may decide to keep interest rates low and possibly even go negative, as Europe and Japan have already done. A strong corporate or government bond bought today with a duration of 10 years would see appreciation of 10% , 20% and even 30% in the event of a decline from 2% levels to levels of negative 1% and negative 2%. Unfortunately, such an outcome is not only a likely result of a severe drop in stock markets and real returns worldwide, but also may even exacerbate those conditions – due to its negative psychological impact on investor confidence and disruptive impact on careful capital allocation. So the small gain you might see in the 40% of your portfolio held in bonds could be more than swamped by the disruption in your stock portfolio. It is these dismal future prospects that have led people Warren Buffett to project that future decades will not bring the 9% averages a long term investor could aspire to, but rather much lower averages in the 2-4% range. An overall mixed portfolio that could yield 8% to 10% on average in the past is more likely to product 2% to 4% in the future, with a lot of short term pain along the way. Disclosure: The material presented on this site is for illustrative and educational purposes only. The graphs shown above represent back tested results and do not reflect actual investing results. Investing in options involves risk of loss, and these losses can be substantial. 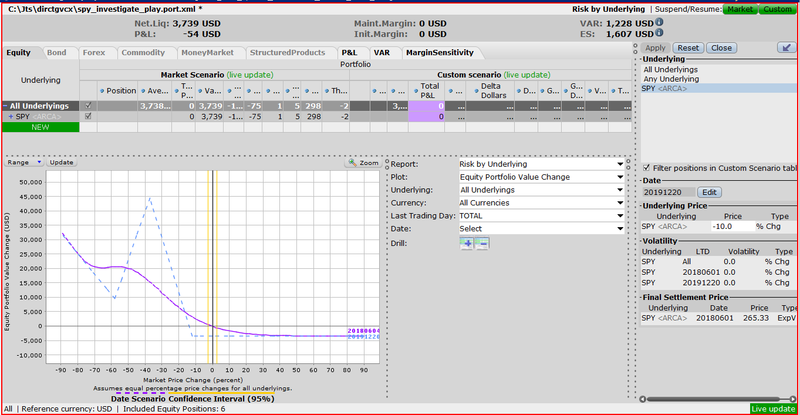 Only risk capital should be used when trading options. We do not currently own any funds discussed in this article. We are a fee-only investment advisor, and are compensated only by our clients. We do not sell securities, and do not receive any form of revenue or incentive from any source other than directly from clients. We are not affiliated with any securities dealer, any fund, any fund sponsor or any company issuer of any security. This report is for informational purposes only, and is not personal investment advice to any specific person for any particular purpose. We utilize information sources that we believe to be reliable, but do not warrant the accuracy of those sources or our analysis. Past performance is no guarantee of future performance. Do not rely solely on this research report when making an investment decision. Other factors may be important too. Consider seeking professional advice before implementing your portfolio ideas.